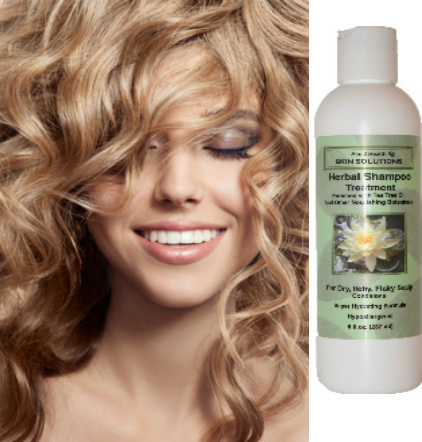 Herbal Shampoo Treatment - Formulated with special vitamins & herbal botanicals to repair and restore dry, itchy, flaky scalp conditions, dandruff, eczema and psoriasis. Restores the natural PH of the hair & scalp that most other products strip away. Quickly nourishes, cleanses and repairs problem scalp 7 layers deep. Can be partnered with our incredible Double Strength TheraCream formula for more severe scalp conditions as well as hair loss in men and women. Many of our customers experience fast relief in only 3 to 5 days! Special Blend: Aim 2 Health Herbal Shampoo Treatment is specially formulated with a unique blend of Tea Tree Oil, natural plant sources, urea, herbal botanical extracts and essential hair care vitamins to help relieve and restore uncomfortable, itchy, flaky scalp conditions. Don't be fooled by highly advertised shampoos that are nothing more than glorified detergents that strip your scalp and hair of its natural ph balance and wreak havoc with your scalp! Tea Tree Oil: One of our top performing ingredients is Tea Tree Oil which has been used for many, many years by people around the world for its' extraordinary medicinal qualities. It has a very helpful restoring effect on skin infections and scalp disorders of every kind. Urea: Also included in our fast working shampoo is urea which has been medically proven in various clinical studies to have superior anti-fungal and anti-microbial properties that helps promote fast healing of dry, cracked, split skin, eczema, psoriasis, rashes, acne as well as dry, itchy, flaky scalp as well as adding much needed moisture. Rinses Clean: Herbal Shampoo Treatment RINSES CLEAN! And it restores the natural PH of the hair & scalp that most commercial shampoos strip away. It's truly one of the best remedies to help repair and hydrate the scalp for long lasting relief. Our shampoo can even be used on babies and small children! It's safe for the whole family and it's hypoallergenic. Clean and fresh with a natural herbal scent. For Severe Dry Patchy Scalp Conditions: If you are experiencing dry patchy scalp symptoms with white flaky patches or red dot like patches then follow this routine: At night before bedtime, rub our Double Strength TheraCream into the parts of the scalp affected with the patches. Allow to absorb overnight into the 7 layers of scalp tissue and wash hair in the morning with our Herbal Shampoo Treatment. Repeat as necessary until the problem is gone. 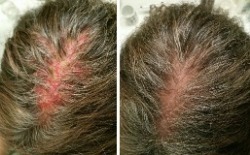 For Hair Loss In Men As Well As Women: Follow the same procedure as above but more frequently to unpack the dry, damaged cells that lie 7 layers beneath the scalp surface. This is critical in bringing balance back to the scalp so that the hair folicles can thrive and further hair loss can be prevented. May also stimulate a rejuvenation of hair growth due to this restored balance as our customers have experienced.